Aramid fibres can be used as reinforcement alone, but also combined with other fibres. This way the properties of the composing fibres are enhanced by synergy. In other words, when two or more fibres are combined, the resulting material tends to keep the good properties and drop the bad ones. Aramid fibres woven into hybrid fabrics with Carbon fibre will combine a range of properties. 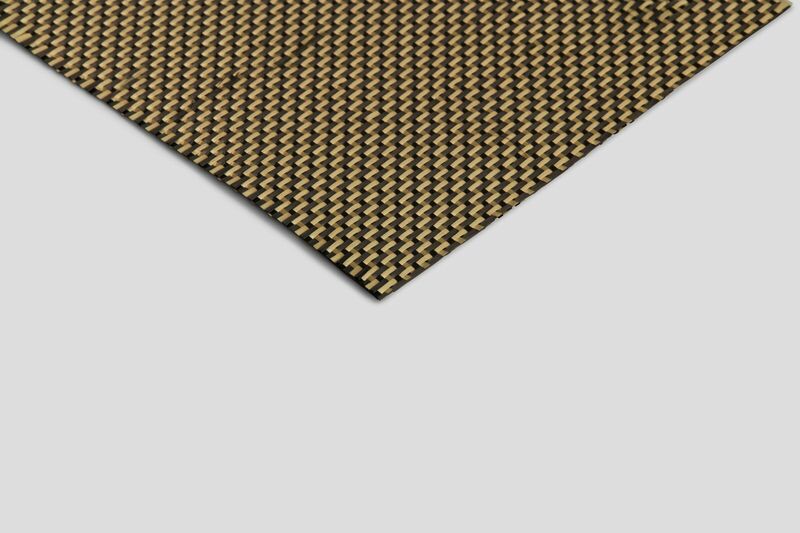 Carbon provides high levels of stiffness and strength, whereas aramid provides huge impact/abrasion/fracture resistance. This distinct look of this hybrid cloth is used in many high-performance, high-impact applications such as canoes, military ballistics and rally-car panelling. The twill cloth can be used in just the same way as standard carbon fibre. It is suitable for use in wet-lay, vacuum bagging and resin infusion manufacture.